As I've had new people to write to recently, I quickly ran out of the pretty stationary I had. 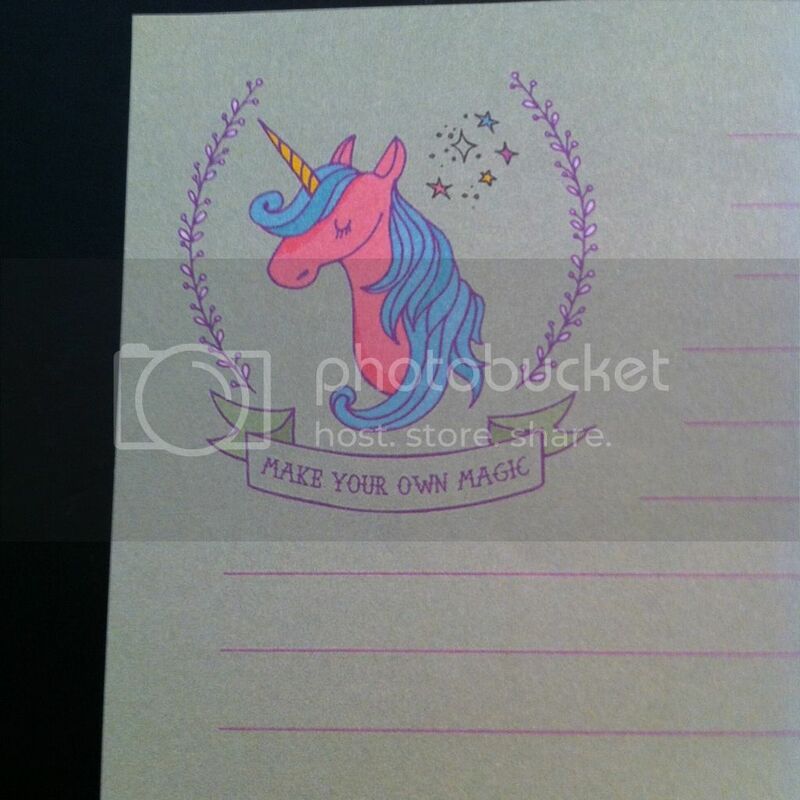 Fortunately, when looking for penpals and found Penpal of the Week, I also discovered that Julie and Denise, the ladies who run the site, also design and sell their own stationary for letter writers at La Papierre. 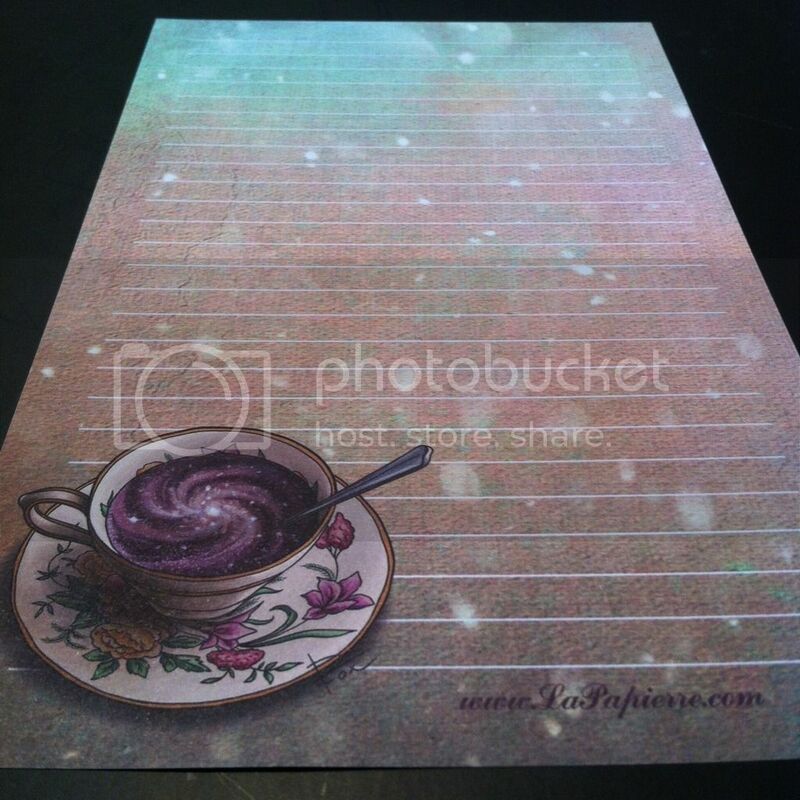 I snapped up a couple of designs, and I was so happy with what I bought, I thought I would share my thoughts with you. 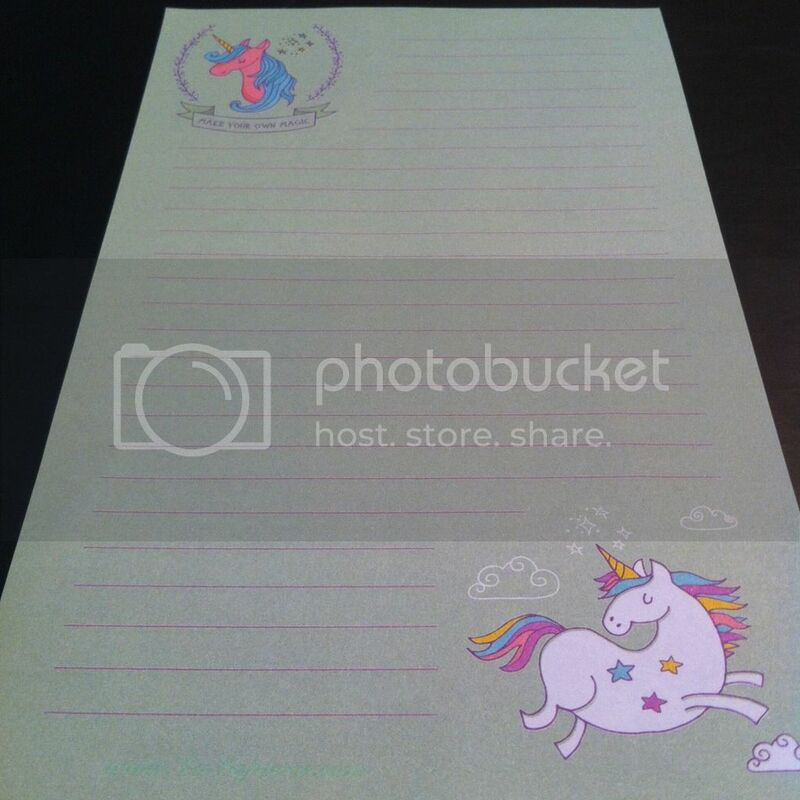 I ordered 12 sheets for £3.60, and so far it's the stationary I've been returning to most often. 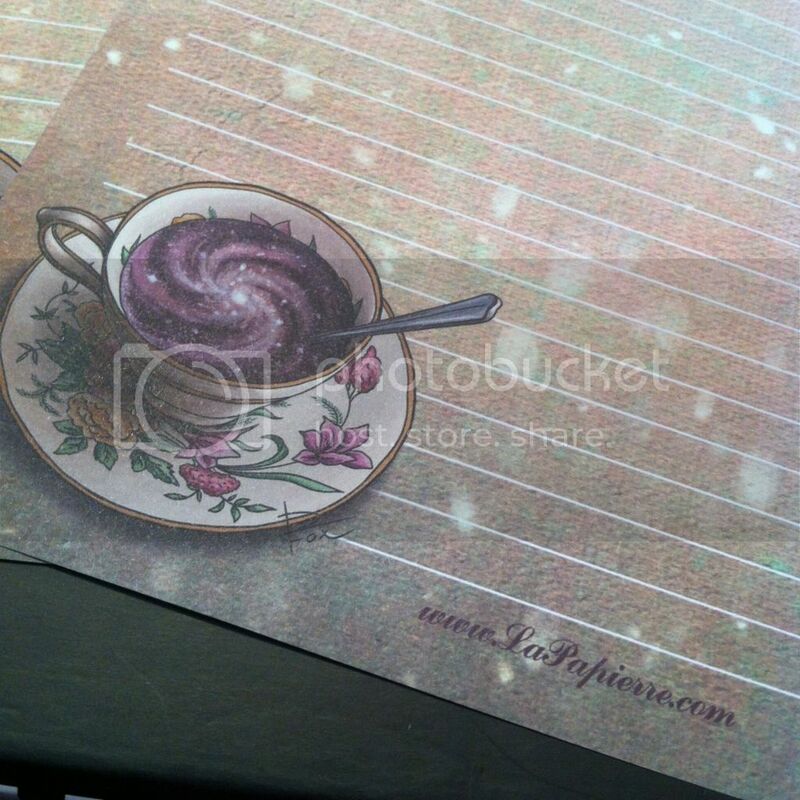 I just love the illustration of a galaxy in the cute and kitsch teacup! I also love the ombre effect of pale green to beige to brown for the background of the paper with the bokeh-like touches. It's so gorgeous! My only real issue with it is if you're writing in black ink, your writing may become a little difficult to on those last three lines. But it's so pretty! And I love how the design actually gives you a lot of writing space. Also, all the stationary I bought is one-sided, with the other side white; not as pretty, maybe, but more space for writing. Again, I bought 12 sheets for £3.60. 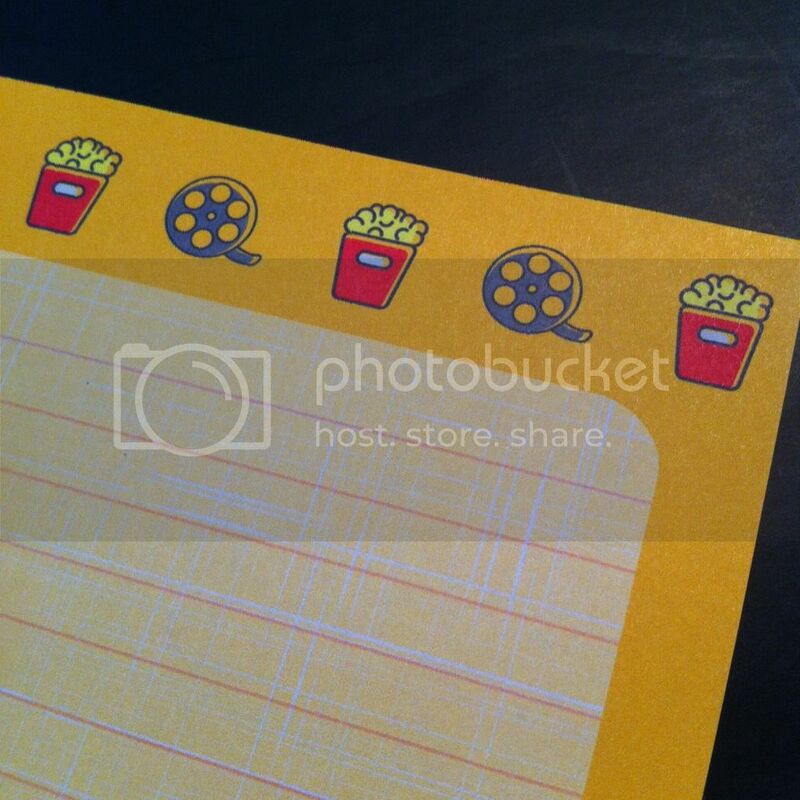 Aesthetically, I really like this stationary! I do make wishes, so this really makes me smile! I also love that the stars fall into the white letter writing area, too - you might see this better in the photos below. 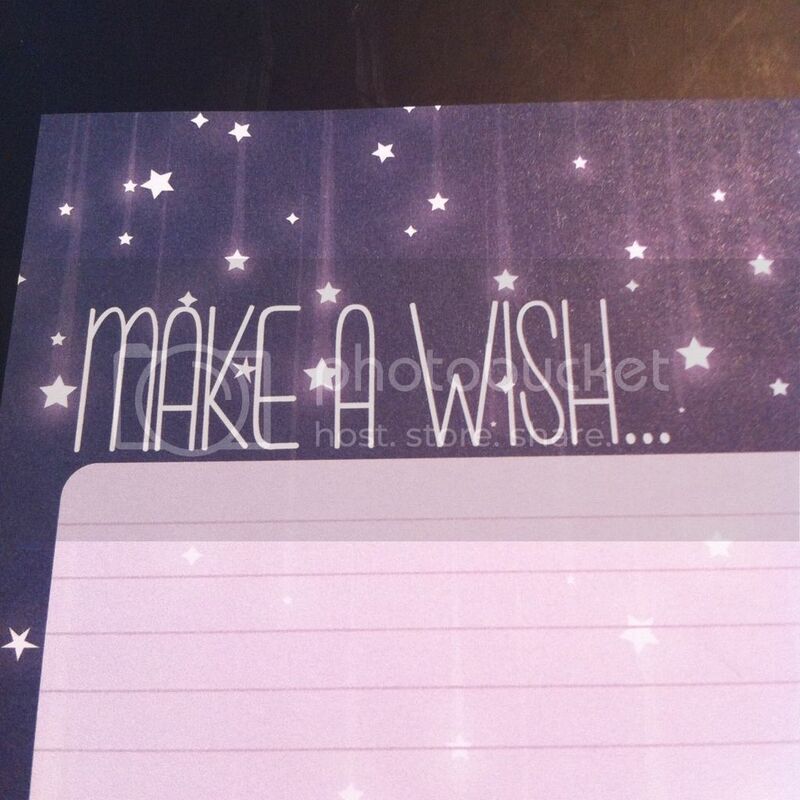 However, as pretty as it is, it doesn't give you much room to write; the "Make a wish" header takes up a lot of space. It also makes it difficult when it comes to writing your address; there's no room for it. I guess this isn't so much of a problem if you have your own address labels, but if you don't... if you write your address at the top right of the writing area, you'll end up starting your actual letter from half-way down the page. I ended up writing my address on a separate piece of paper, and washi taping it to the right side of the header. It didn't look so great, and so I've only used this once so far. The only other solutuions I can think of is either leave your address off the letter and have it just on the envelope, or use different stationary for the first page. Neither really appeal to me, though. I guess I'll have to invest in some pretty address labels. 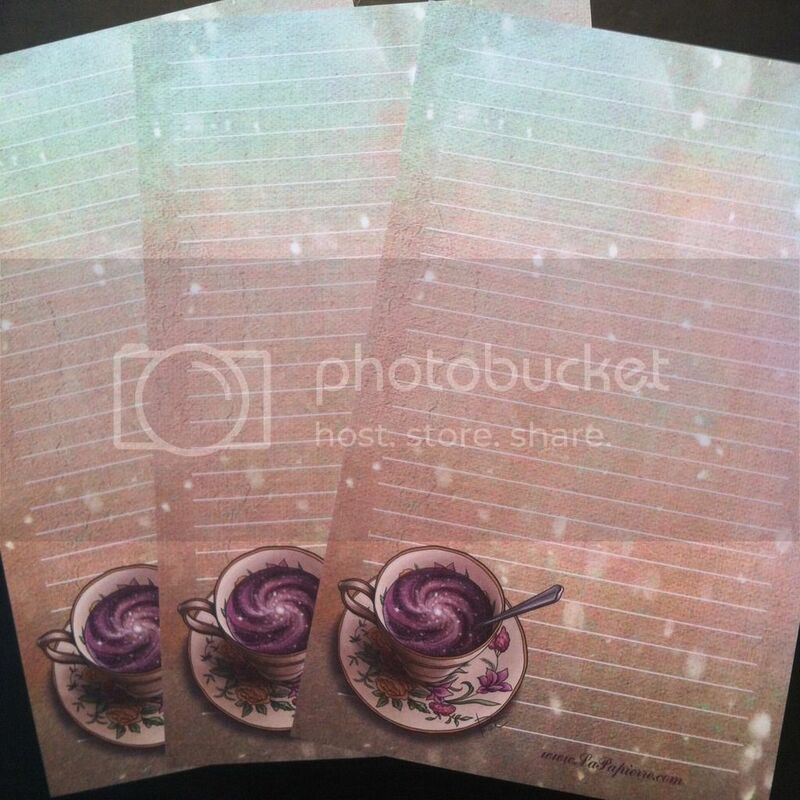 Despite this being really pretty stationary, I don't know if I'll be using it that often - until I get my labels. 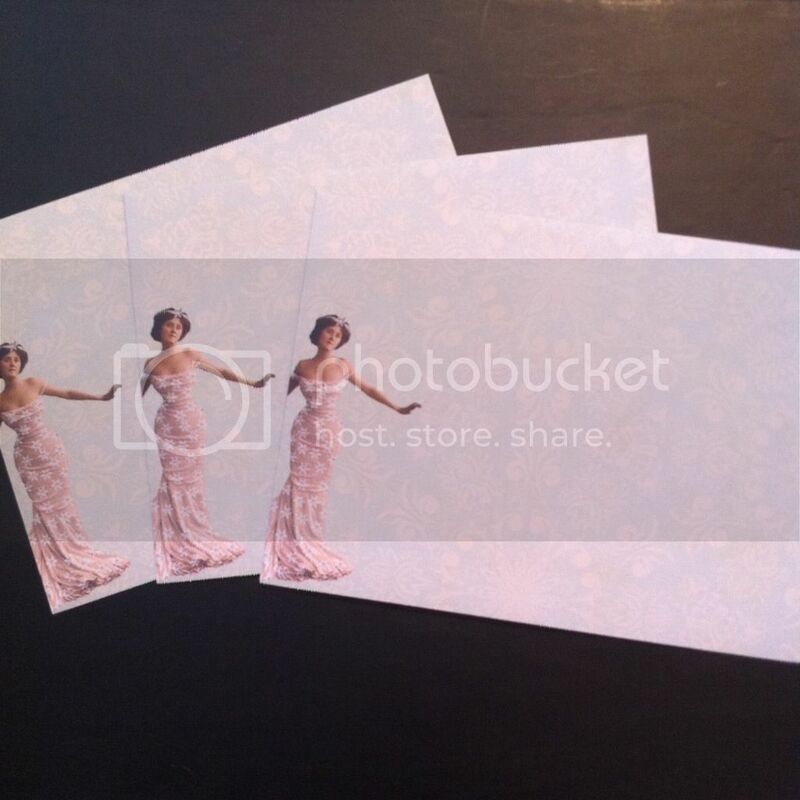 As neither of the designs above came with envelopes, I ordered a pack of seven Claire de Lune envelopes for £3.60. 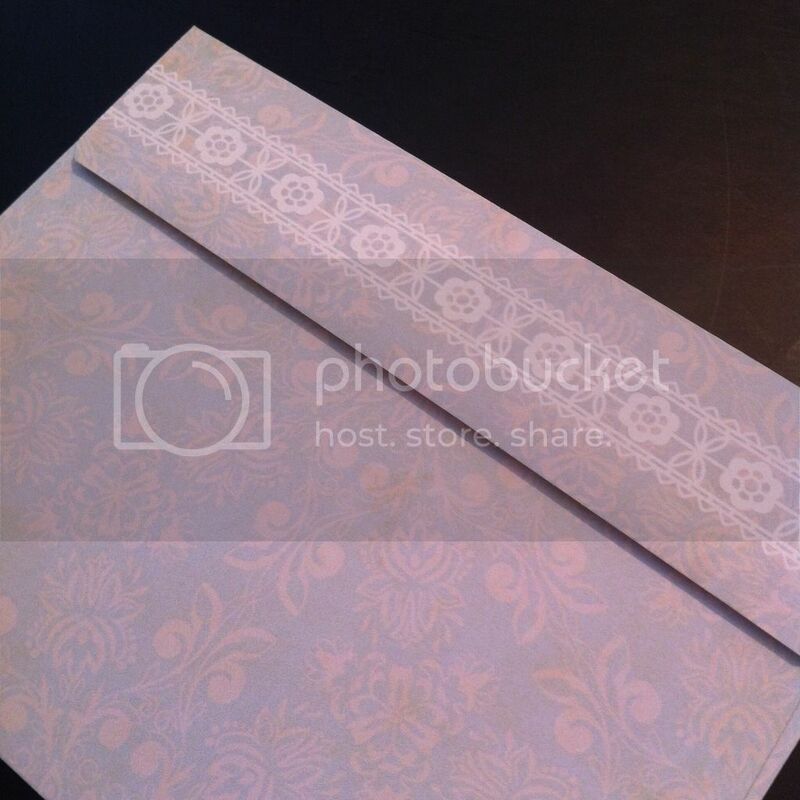 These envelopes are so cute! They look really lovely as they are, but there's also a lot of space to get creative if you're into mail art, and creating a vintage or 1920s theme. And I love the white detailing on the back! 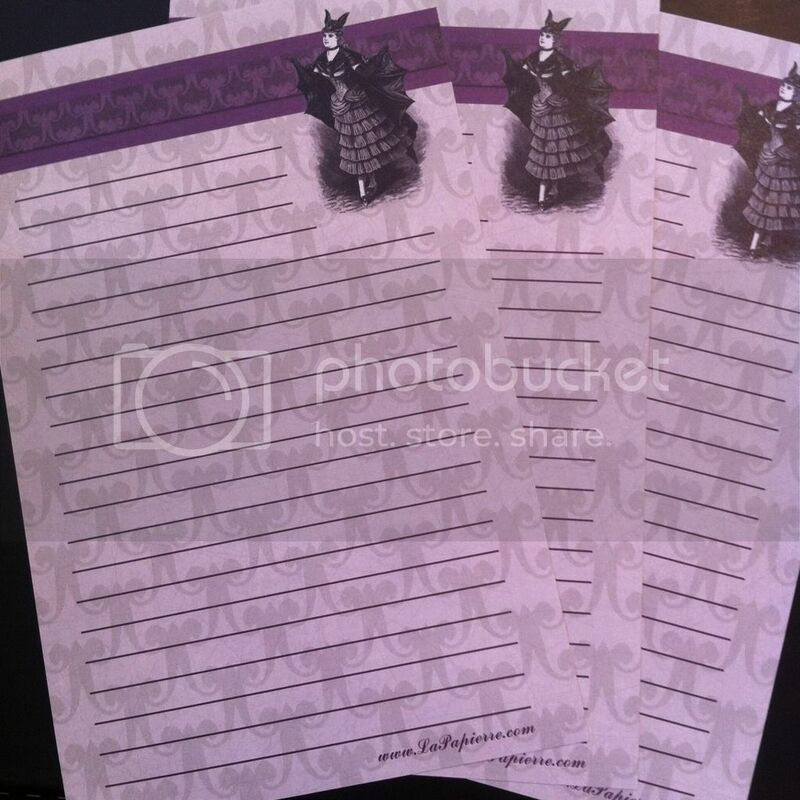 The letter set includes 15 sheets of paper, 2 envelopes - one black and one lilac, a postcard and a bookmark, for £7.20. 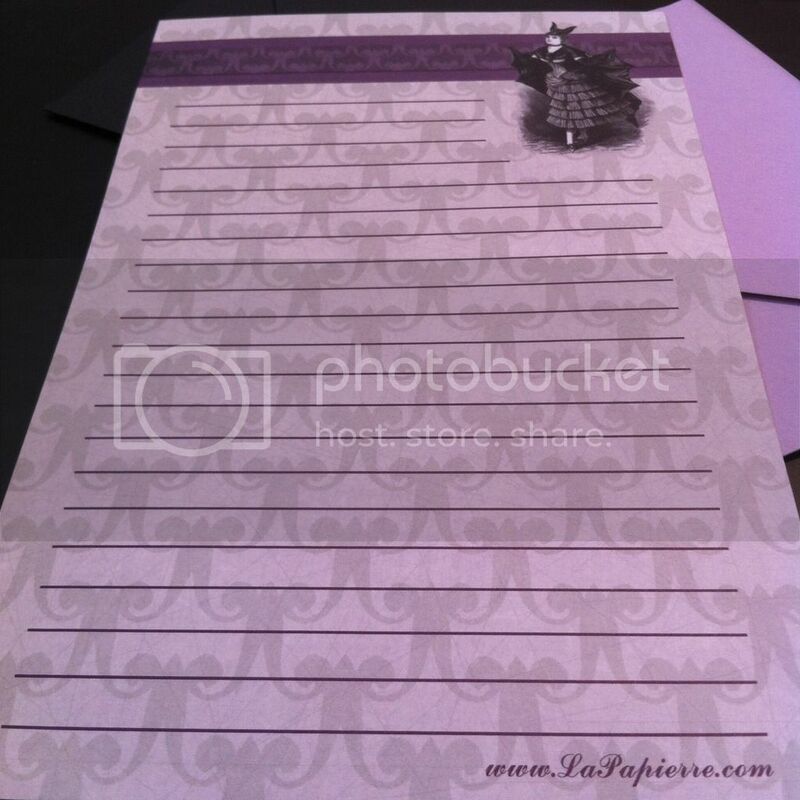 For the same prince you can also get 14 sheets and 3 envelopes or 10 sheets and 5 envelopes. This is by far my favourite of the lot! I've yet to actually write any letters on it because it almost feels like I'll be ruining it! 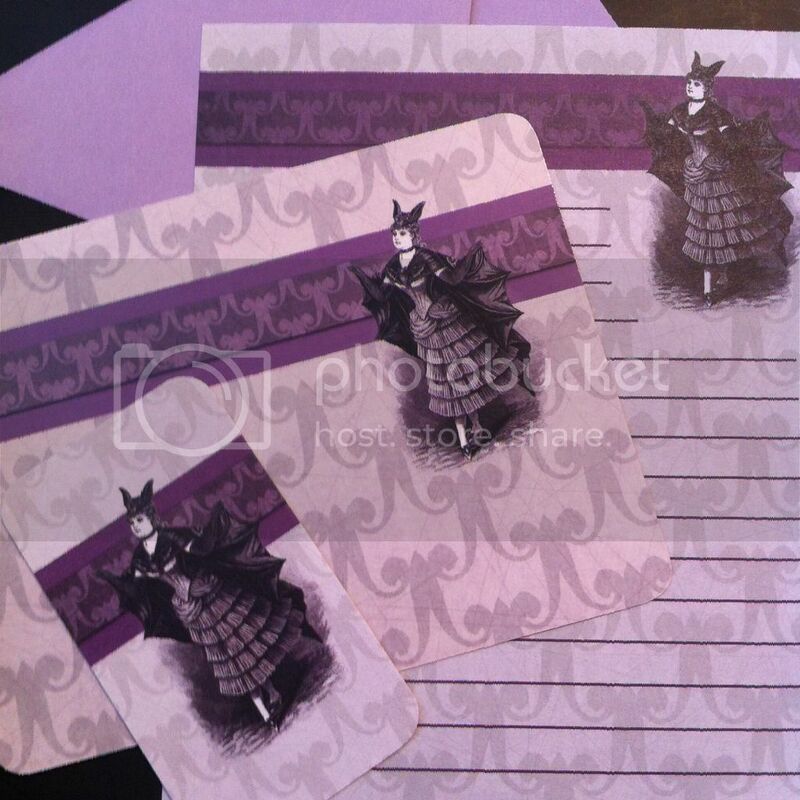 I love the gothic vibe and how it incorporates all my favourite colours - black, purple and silver! (I suppose technically it's grey, but shh.) Because of the placing of the illustration, there's going to be some trouble with writing my address on these sheets, too. Without address labels, I really don't know how to get around that. 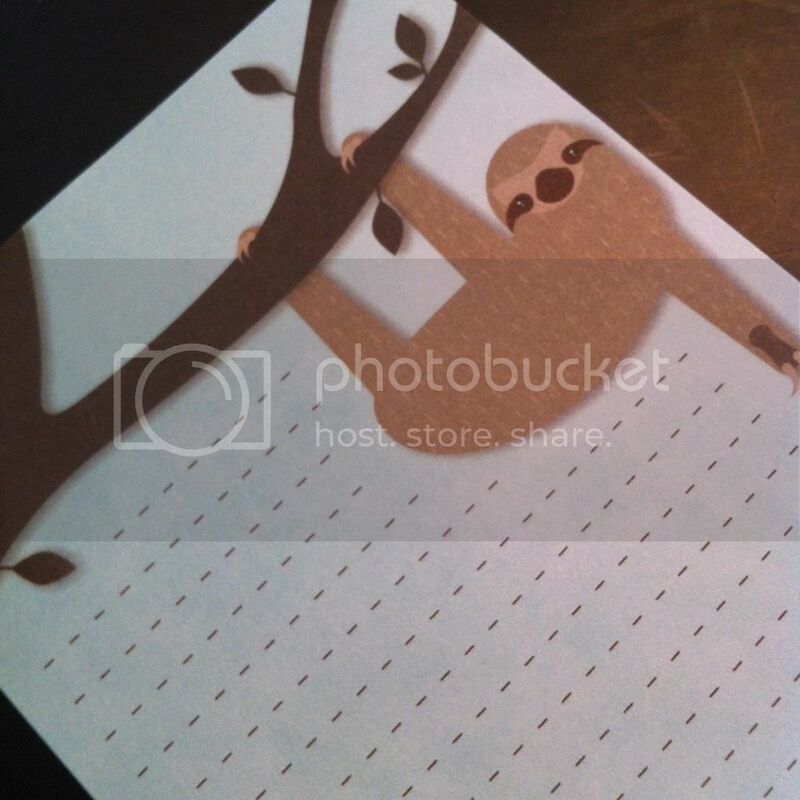 I also really love the bookmark and postcard - the bookmark is perfect for use on a flip book or pocket letters, and both could be used in scrapbooking! 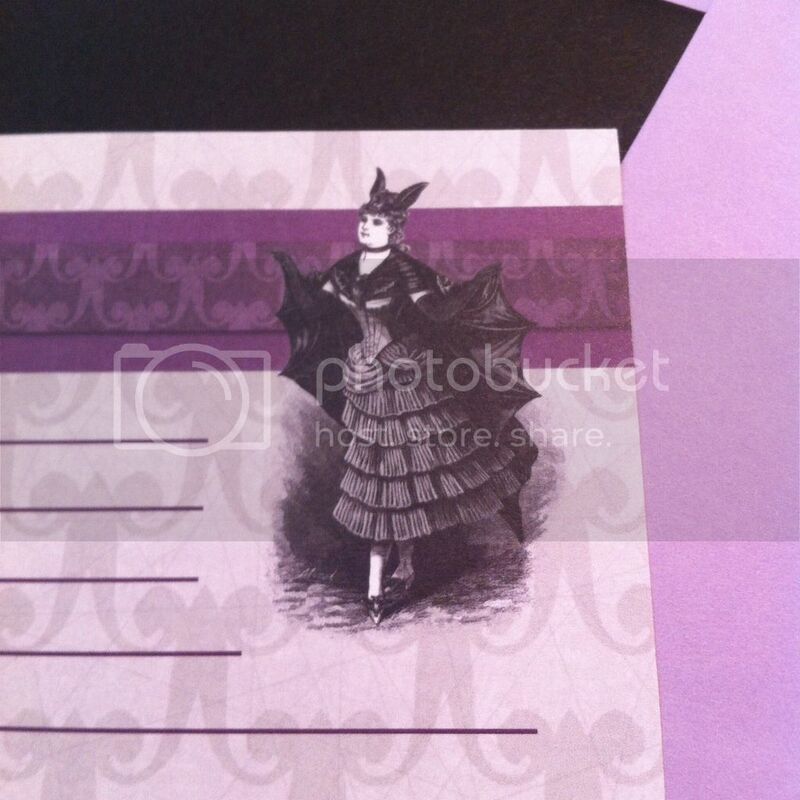 It's worth noting that all sheets of paper are advertised as A5, but the Madam Bat sheets come up a little bigger. I think the Madam Bat sheets are A5, and all the others are a little smaller, but I couldn't say for sure. 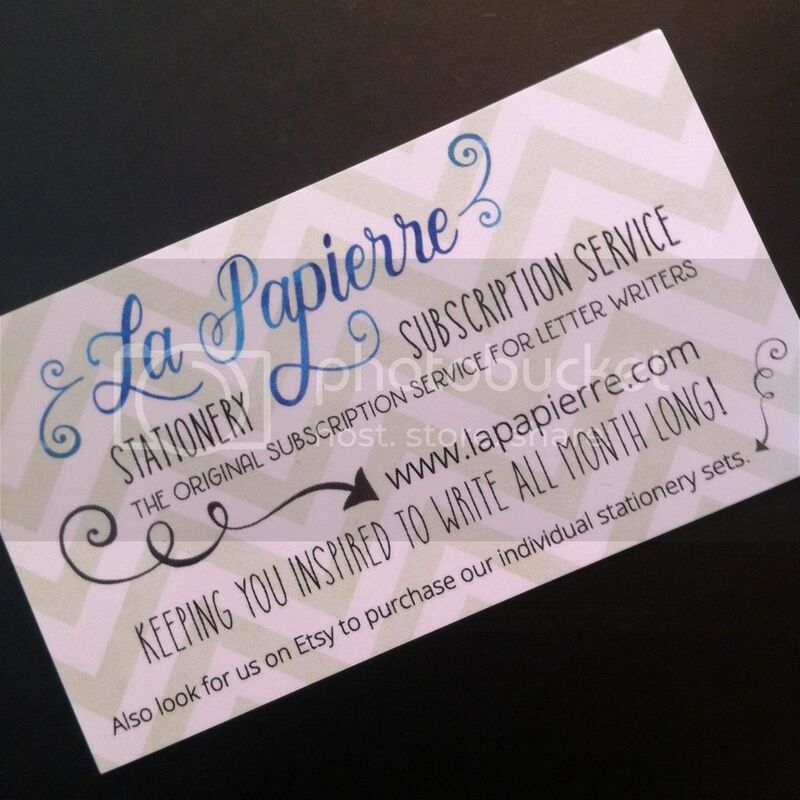 La Papeierre also offers discounts - 10% off orders over $20 and 30% off orders over $60 - so I got 10% off my order. 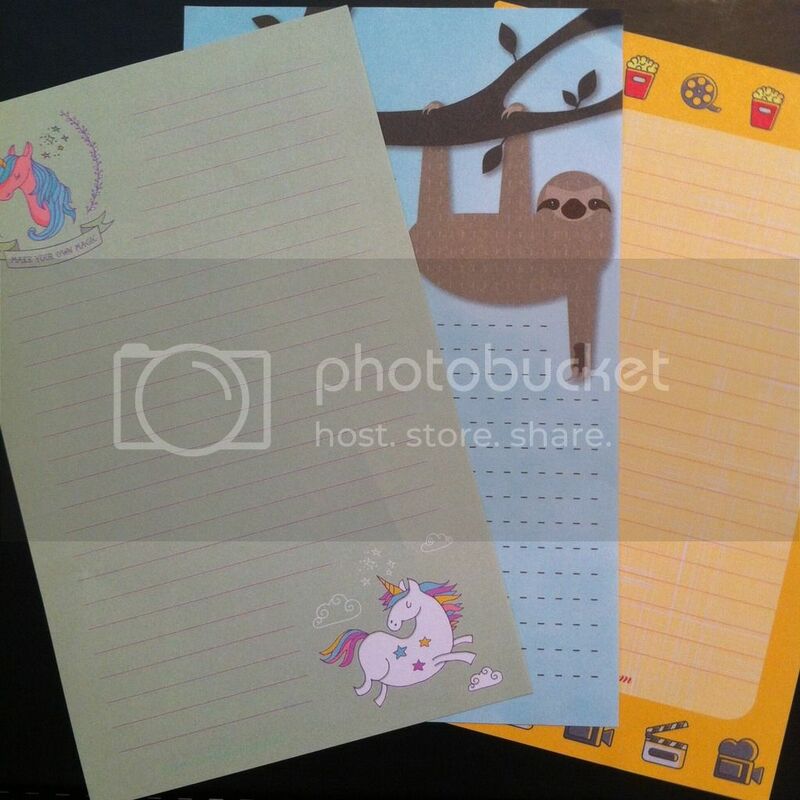 And I received three sheets of surprise letter writing stationary, one from the Slothy Sloth and two from ranges no longer available. The SSS offers three monthly plans, with free shipping for those in the USA and Canada, but a little added on top for international customers for shipping. The plans are a 12 sheets (6 designs, 2 sheets of each) for $6 ($8 for international - which is £5.58) a month, a 24 sheets (6 designs, 4 sheets of each) for $10 ($14 for intl - which is £9.76) a month, and a 48 sheets (6 designs, 8 sheets of each) for $18 ($24 for intl - which is £16.73) a month. 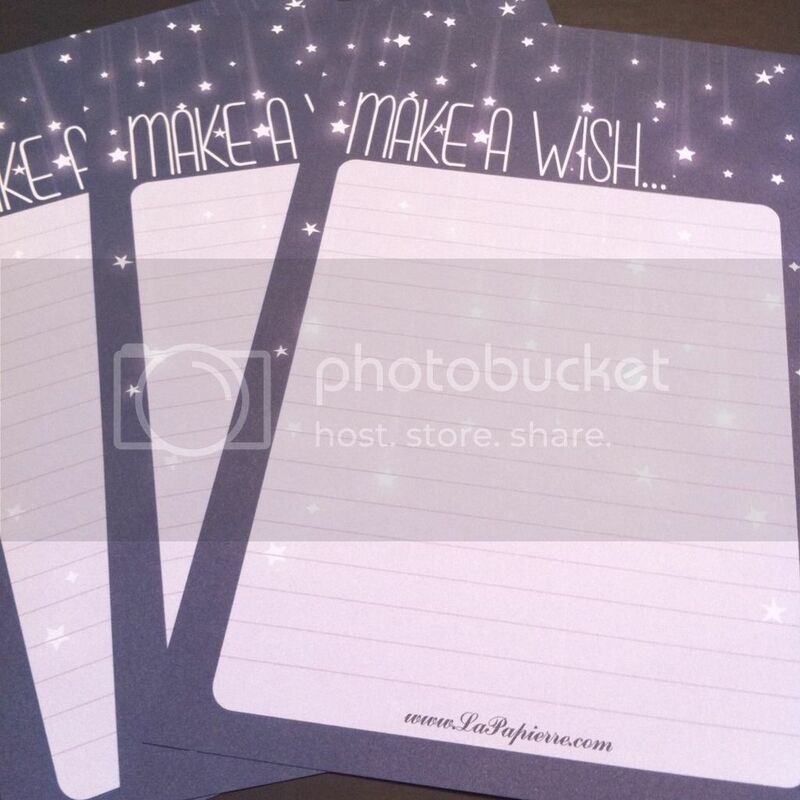 You also have the option to add envelopes to any plan - 6 envelopes for an added $6 or 12 envelopes for an added $10 (it'll be a little more for intl orders). I think this it's pretty good deal, so once I've got my finances sorted, I'm really considering subscribing. I'm always going to need stationary now I'm writing to so many people! What do you think? 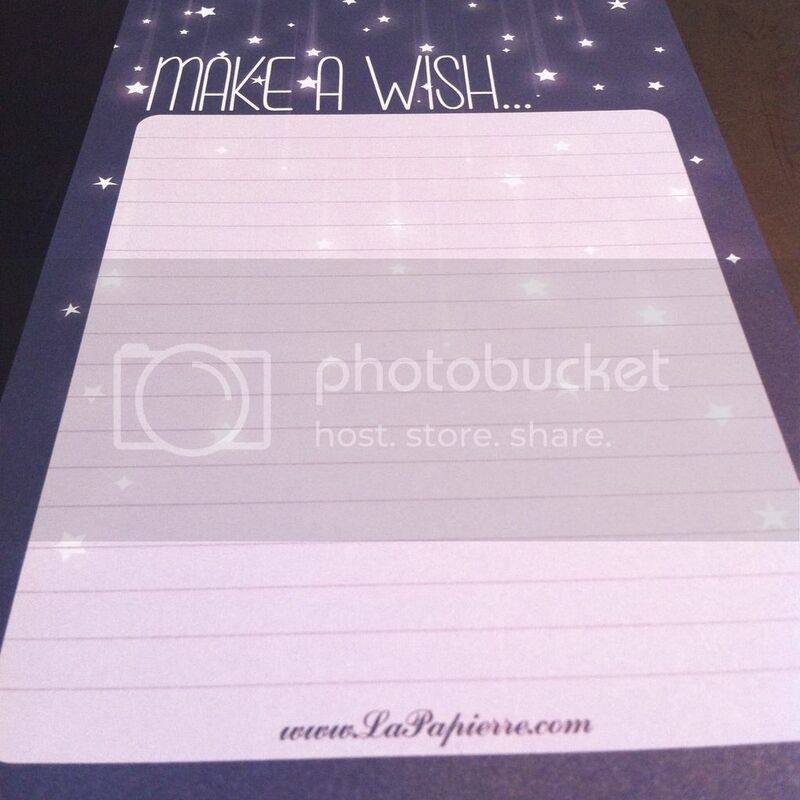 Have you ordered from La Papierre before? Will you be doing so now? In case you're interested, I now have an Instagram account for my snail mail - @jo.scribblesmail.